Gigabit Passive Optical Network (GPON) is a high bandwidth shared fiber access technology. GPON is a point-to-multipoint access mechanism. Its main characteristic is the use of passive splitters in the fiber distribution network, enabling one single feeding fiber from the provider’s central office to serve multiple homes and small businesses. GPON has a downstream capacity of 2.488 Gbps and upstream capacity of 1.244 Gbps that is shared among users. Encryption is used to keep each user’s data secured and private from other users. Although there are other technologies that could provide fiber to the home, passive optical networks (PONs) like GPON are generally considered the strongest candidate for widespread deployments. The following diagram shows the architecture of a basic two wavelength GPON network, which is probably the most common implementation. The downstream wavelength is 1490nm and transmits data at 2.488 Gbps. The upstream wavelength is 1310nm and transmits data at 1.244 Gbps. 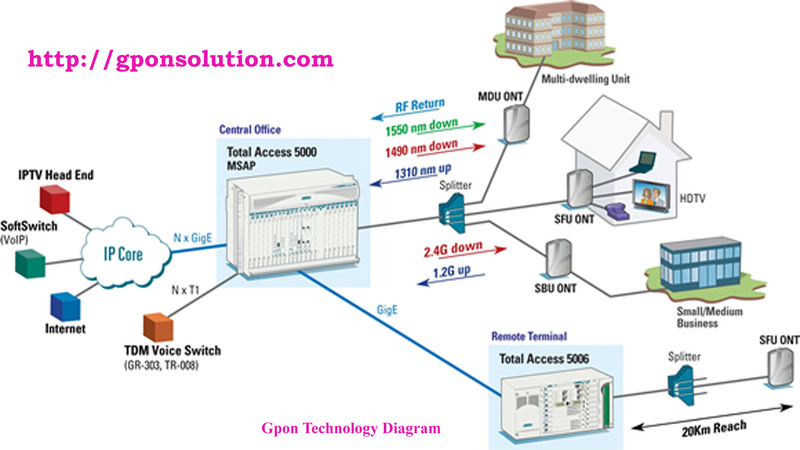 The GPON Optical Line Terminal (OLT) is typically installed in a Central Office (CO), though it could be installed elsewhere. The optical splitter is installed somewhere between the CO and the subscribers. And a GPON Optical Network Terminal (ONT) is installed at each subscriber’s home. Voice, video, and data traffic must all be delivered across the single GPON downstream wavelength. A nice facet of GPON for IP video support is that its downstream is naturally a broadcast medium, and it is very efficient for delivering multicast traffic. GPON technology is designed to provide the speed and bandwidth required for seamless services including voice over IP, high-speed Internet, and IPTV. Huawei recently successfully completed 10G GPON full-service test with Etisalat on existing gpon network. Huawei offers 10G GPON solution service is higher bandwidth with an abundance of features, supporting a wide range of services and scenarios. As a fully-compatible service, the 10G GPON technology can utilize the existing infrastructure without affecting the ODN (Optical Distribution Network). Also UAE’s Etisalat Group and China-based manufacturer Huawei announced the signing of an agreement to test an ultra-fast 40Gbps Gigabit passive optic network (GPON) across Etisalat’s footprint in the coming four years.